I have been learning Tsugaru Shamisen now for about three years. I love the instrument. I’ve tried to learn several instruments in my life. This is the first time I’ve found an instrument that speaks to me. 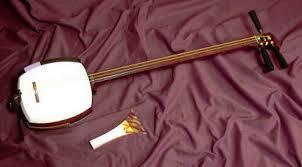 For those who don’t know what a shamisen is. It is a three string percussion instrument. In English it is often called a three string guitar, but this isn’t an accurate description. Having learnt the guitar as well I can say these two instruments are very different. As you can see in the picture below the instrument has a drum. While at times you do pluck the strings usually you strike the string along with the drum. In a room with good acoustics this has an amazing effect on the music you are playing. I have a lesson three times a month with my instructor. Instruction is all done by ear. There is no sheet music. The teacher will play the piece then I will copy it. We go through this several times until i have learnt the piece by rote. In this way I have memorised seven pieces of music. I also film each lesson so that I can get my practice correct at home. The skills I’ve learnt in this class have really helped me develop my listening skills. I also think, although I haven’t tested this theory, that I may be able to learn new songs by watching people perform on video provided. Hopefully I can get it to the stage that I can learn new songs by listening. The whole experience has been rewarding. There have also been bumps along the way due to language barriers. My teacher speaks no English and while my Japanese listening skills are good I have never developed a good rapport with my teacher. I find her very difficult to talk with. One problem is my manner when explaining that I am having difficulty with something ends up being very abrupt. Not at all what my teacher expects from her student. Thus I have had two incidences where the teacher has stormed out of the room refusing to teach me. I guess considering I’ve been learning from her for three years twice is a pretty good record. Both times, her reaction has caught me completely by surprise. The first time she was playing through a piece of music i wasn’t feeling confident with at the full speed it’s meant to be played. I felt very frustrated and eventually called out that she was playing too fast and I couldn’t keep up. She rebuked me saying I wasn’t practicing enough and told me to get out. At the time I felt very incensed since I had been practicing as often as I could but just didn’t feel like I knew the song. The second time was yesterday. I was having difficulty with part of a song I was playing. My instructor corrected the part and I was trying to play it by myself. I saw her reach for her shamisen to show me how to play it and I put out my hand to say ‘No, I can do this.’ In English this is a sign of my determination to get it right by myself. In hindsight instead of saying ‘Dekiru’ i should have said ‘Yattemiyou’ meaning I want to try it. She sat there watching me play through the piece. I had no idea she was angry and when i looked up at her asking if I got it right. Her response puzzled me. She said ‘I don’t know, what piece were you playing?’ She then berated me for saying that I can do it when she thought I couldn’t. She ended the lesson there much to my shock and anger. Looking back I realise she was taking my words as a hostile act. In her mind if the teacher thinks you can’t do it then you stop and let the teacher correct you. You do not say ‘No, I can do it.’ I love playing the shamisen and I have enjoyed the way it is taught but these times where the teacher has refused to finish a lesson have soured my feeling toward the teacher herself. I suspect though that this is they way music is taught in Japan. You must respect the teacher. You cannot question. Teacher knows best. I’ve always had a problem with respecting people. To me respect is not something you demand. It is something you give to someone you feel is worthy. I guess this is just another cultural difference I must overcome if I want to learn the instrument I love.